However, with the mass amounts of information available online, it can be difficult to stand out from the crowd. In order to do so, you need to offer something irresistible in exchange for a potential client or customer’s contact information. A lead magnet or content upgrade can be just the thing you need to differentiate yourself from your competition and build your list of potential customers. By adding an opt-in to your website, you’re able to provide direct value to your target audience while also capturing the information you need to stay in touch. If you’re an ActiveCampaign user, you can easily add a lead magnet or content upgrade to your site. While there isn’t a direct lead magnet feature, a simple workaround allows you to install an opt-in to your website that can help you generate high-quality leads. Here is a step-by-step guide to creating a lead magnet or content upgrade with ActiveCampaign. In order to get your leads to sign up for your lead magnet or content upgrade, you need to supply them with a form. This form gives your leads an opportunity to share their contact information with you, regardless of where they are on your website. The next step is to actually create your new form. Head back to the Forms section of your ActiveCampaign dashboard and select “Create a New Form.” You’ll then be brought to an example of what your form will look like. Feel free to customize this content to fit your unique needs and preferences. However, within this form, you want to add both of your new hidden fields. Find your “Name of Lead Magnet” and “Download URL” fields and drag them into your form. Once your form is complete, hit “integrate.” This will then give you a variety of ways to share your form, such as an embedded code or a link. Include the form on your website whichever way works best for your target audience. When you install this automation, you will be asked to select a form that will act as a trigger for this automation. Choose the form you created in Step 1 and hit “Next.” The program will then generate a workflow, including an email that will send after your lead fills out the form. To edit the email, click on the corresponding box within the workflow. You can then select “Edit,” where you will be brought to an email template. Within this template, you can edit text, add images, and make the email entirely your own. However, you also need to include the personalization tags you included within the form you developed in Step 1. These personalization tags can be found by visiting the “Forms” section of your dashboard and scrolling through until you locate the “Name of Lead Magnet” and “Download URL” fields. These tags will be displayed as text between two % symbols, such as %NAME_OF_LEAD_MAGNET% or %DOWNLOAD_URL%. Add these personalization tags to their respective locations within the email template. After your automation is set up and the code for your form is properly added to your website, you’re ready to begin collecting leads and sending them your lead magnets. However, you want to properly test the system before you make it available to the public. Fill out the form with your own email and see if you’re able to successfully download the content you were after. Continue to test with different opt-ins or lead magnets. The form you created should adjust to meet the changing needs of your target audience, allowing you to save time and resources by not needing to create a new form for each content upgrade you offer. It can take some time before you uncover issues associated with your lead magnets. However, properly tracking and testing your lead magnet forms can ensure you find any mishaps before they become a problem. Make the appropriate changes quickly to avoid missing out on new leads and opportunities. If you already use ActiveCampaign, you don’t need to download a new tool if you want to offer a lead magnet or content upgrade. Through working around the systems and procedures used within ActiveCampaign, you can easily create a workflow that allows you to stay connected and engaged with your leads. Develop high-quality lead magnets and content upgrades that will pull your audience in and keep them interested. 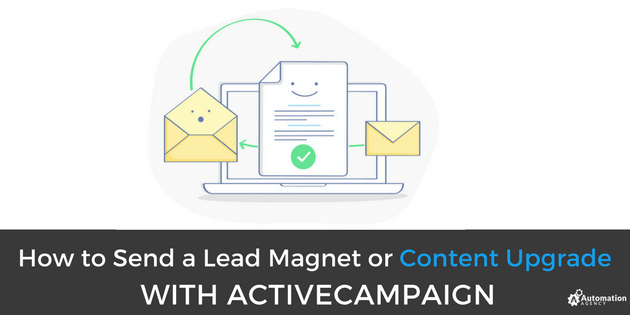 With the Lead Magnet Opt-In Delivery by Automation Agency ActiveCampaign Automation Template, you can provide each lead with the information they’re looking for to stay engaged – building your authority and bringing you more business.